Welcome to The Hobbyist’s Review, a semi-regular series in which I take a different look at Warhammer Age of Sigmar battletomes, old and new. For me, the most appealing thing about a new army, faction or battletome is the chance to put my own stamp on the models in creative ways. That can be through an unusual paint scheme, unique conversions or even an entire army-wide theme. Ideas can come from a wide variety of sources, but the intricate and evocative lore created by the Games Workshop writers never fails to inspire. The Hobbyist’s Review series considers Age of Sigmar battletomes based on the scope and opportunity they offer for the creative hobbyist, using the lore presented in the books as a jumping off point, and suggesting ideas that you might like to think about for your own projects. 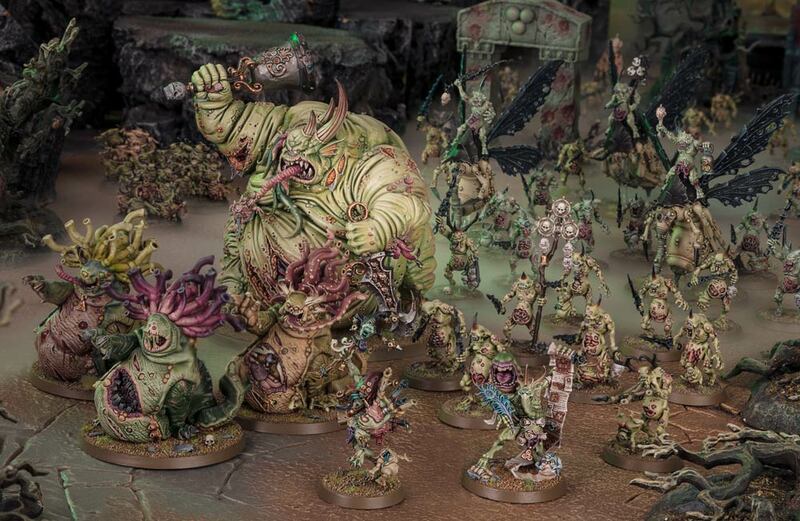 Before we delve into the specifics of the Maggotkin of Nurgle battletome, it's worth pointing out that any Chaos army offers a certain base level of opportunity for those who like to convert and customise their models. Anything with the taint of Chaos is potentially susceptible to all manner of exotic mutations, so there's no reason why any Maggotkin of Nurgle model need look the same as the picture on the box, or indeed as any other model in your army. This battletome could be a gangrenous flop (spoiler: it isn't!) and you could still add tentacles, eyeballs, extra limbs and other weird growths to your heart's content! With that established, let's jump in and see what more the Nurgle book has to offer. 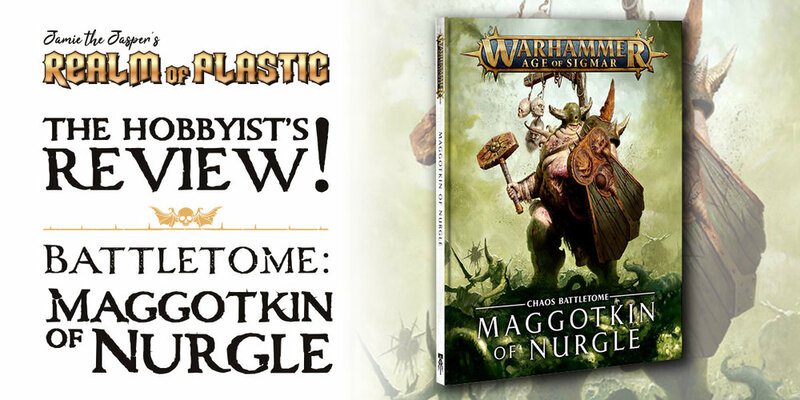 The Maggotkin of Nurgle battletome occupies an interesting position as the first battletome written with the second edition of Warhammer Age of Sigmar in mind, but released before this new edition was even announced. As such, it bears the hallmarks of both the old and the new generations of battletome, although on balance it is very much a second edition book, with all of the depth and quality that implies. I’m not a Nurgle player, but I’m reliably informed that this book offers a great deal of flexibility and tactical depth from a list building and gameplay perspective. In some ways you could argue that this battletome is an exercise in consolidation. Nurgle has been established in the lore of all Games Workshop’s settings from the very beginning, and you might think that the god of disease and decay has already been explored from every conceivable angle. Surely all that the Maggotkin of Nurgle battletome can do is retell essentially the same stories and tropes, transplanted to the setting of the Mortal Realms? Well, sort of. But not quite. The Maggotkin of Nurgle battletome makes a genuinely interesting effort to break new ground by positioning Nurgle not just as a god of disease and decay, but as a god of life - decay just happening to be the Plague God’s favourite part of the natural cycle. This isn’t the first time that the natural world has been a key part of Nurgle’s lore - the Garden of Nurgle is the god’s long established domain in the Realm of Chaos - but, to the best of my knowledge, this is the first time that the connection between life and decay has been expressed so clearly and so inventively. This is reflected in the addition of the Feculent Gnarlmaw, a new terrain piece that actively buffs the armies of Nurgle, represented as a twisted and festering tree. The model is wonderful, but there are also opportunities here for hobbyists to scratch-build their own warped interpretations if only for the sake of variety, since it’s possible to have more than one of these in play at any given time. As I’ve mentioned the models, let me also take the opportunity to say this - the new models released to accompany the battletome are some of the best that Games Workshop has ever made. The Maggotkin of Nurgle miniatures range is stunning just as it is. But of course, some of us will always feel the urge to mercilessly chop up these beautiful miniatures and do something different with them, and that’s what these articles are all about! Expanding the scope of Nurgle’s sphere to more explicitly include not just decay but the cycle of life in its entirety is a very smart move, as it opens up rich new veins of imagery and symbolism. No longer is Nurgle just about rotting flesh and rusty axes - we can now add all the splendour of the natural world and its unfettered growth into the mix, albeit represented through a twisted and sickly lens. The natural world is a bottomless resource for hobbyists when it comes to conversions and army themes. For example, when describing the Garden of Nurgle the battletome mentions areas of jungle, swamp, forest and even ornamental parkland! If you think about the diversity of flora that hail from these types of biome in the real world, it’s easy to see how one could create a very distinctive looking Nurgle army, if only through creative basing. Then again, if you go on to think about the diversity of cultures that hail from these regions, it’s possible to conceive of some pretty interesting variations on the standard Nurgle warrior too. How about a Nurgle army with a Mayan aesthetic that hails from a fecund rainforest? 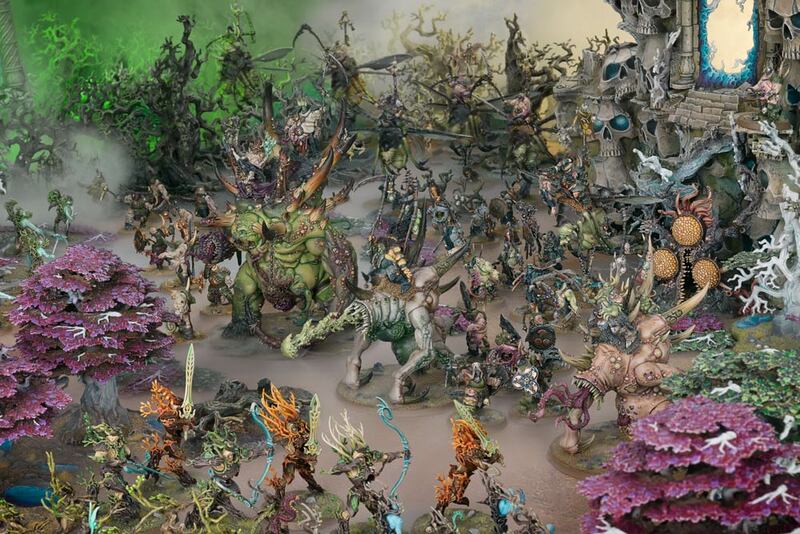 Or a pestilent horde converted and painted in an Afro-Caribbean style, surrounded by mutated tropical plants? A mashup of Nurgle and voodoo sounds like a match made in heaven to me, or at least the more interesting corners of hell. Of course, wherever you find decay you also find its natural vectors in the form of creatures like worms, flies and snails. These have always been a staple of Nurgle’s iconography, and they rear their fugly heads throughout the Maggotkin of Nurgle battletome. At one point the book mentions 'vast earthworks known as Filth Pits that are bored using chained wyrr-maggots', which could prove to be a fascinating basis for some scratch built terrain, or even a whole themed tabletop. These creepy crawlies and their various appendages also find their way into Games Workshop’s Nurgle model range too, although generally in a somewhat limited capacity - a fly head here, a snail-like mount there. It would be interesting to see a Nurgle army that really leans into this theme, perhaps with whole unit of humanoid flies, or a tribe of slimy slug-people. While it’s possible to add Slaves to Darkness, Beasts of Chaos and even Clans Pestilens into an army with the Nurgle Allegiance (more on this later), these aren’t overtly covered in the Maggotkin of Nurgle battletome. The main protagonists here are Nurgle Daemons and Rotbringers, representing respectively the daemonic and mortal components of Nurgle’s elite. The majority of the book is given over to these two ‘sub-factions’, so it’s here that we really need to look for creative conversion and theme-building prospects. And while the lore for daemonic horrors like the classic Plaguebearers, the inspired Sloppity Bilepiper and the iconic Great Unclean One is never less than a joy to read, those prospects are unfortunately thin on the ground. That’s not to say that there isn’t any scope for kitbashing, sculpting and converting a dizzying variety of miniatures along the ‘plague daemon’ theme - that’s been proven by talented hobbyists time and time again, and there are some wonderfully sickening creations out there. It’s just that inspiration will need to come from the hobbyist’s imagination for the most part, rather from the pages of the battletome itself. The lore presented here is brilliantly written and engaging, but it defines the various daemons of Nurgle very clearly and specifically, without planting any seeds of ideas that the creative hobbyist can run with and make their own. For many people that won’t matter one jot, but this is The Hobbyist’s Review after all, and those seeds are like catnip to the inveterate kitbasher! The Rotbringers - the elite mortal followers of Nurgle - are similarly rigidly defined in terms of their appearance, roles and army structure. Rotbringer forces are organised into battle companies called ‘Cysts’, of which there are three types - the Plague Cyst, Blight Cyst and Affliction Cyst. Each of these Cysts is led by a clearly defined hero type, with a specific title and role. For an army of Chaos the Rotbringers are surprisingly regimented, and the battletome presents this as the standard structure for all Nurgle armies, not just an example plucked from a single host or conflict. It’s an odd if perfectly valid choice that unfortunately stifles creativity in terms of army theme and composition - although you are of course free to ignore it, as this lore in no way dictates the composition of your collection. While this may seem a little disappointing, don’t despair. Happily, this odd specificity of character types and army structure is made up for to a degree when the battletome explores some of the famous Nurgle warbands of the Mortal Realms, many of which have some pretty interesting quirks. The Maggotkin of Nurgle battletome includes a section that briefly describes a number of famous Nurgle warbands from across the Mortal Realms. While these aren’t as distinctive and in-depth as the stormhosts of the Stormcast Eternals or the skyports of the Kharadron Overlords (nor do they have accompanying rules and abilities), for me they represent the most rich segment of the book in terms of developing interesting and diverse army themes. Not all of the warbands described are particularly inspiring - the Droning Guard is just an army composed entirely of Plague Drones - but some are an absolute gift for enthusiastic converters. Let’s start with the simpler options. The Munificent Warriors ‘diligently ensure their physical forms are infested with the greatest possible volume of Nurgle’s foul gifts’ - finding inventive ways to sculpt even more rot and exotic diseases onto the already heavily festooned Nurgle model range would be a fascinating and grisly challenge. Then there’s the Befouling Host, which ‘have a fondness for infecting their victims with parasitic plague spores that transform their hosts into living fungus-nurseries’. The fungal aspect of rot is something that we perhaps more closely associate with Moonclan Grots these days, so it would be interesting to see some of the imagery of that model range reimagined for Nurgle. Everyone loves a giant mushroom, especially when it’s growing out of some poor soul’s face, right? Then we come to one of the richer veins when it comes to army theme, in the form of the Drowned Men, who ‘sail over water, land and air alike in rotting and sorcerously infested hulks’. Anyone who’s seen the Pirates of the Caribbean movies knows how effective the nautical aesthetic can be, especially when spliced with the themes of magic and decay. 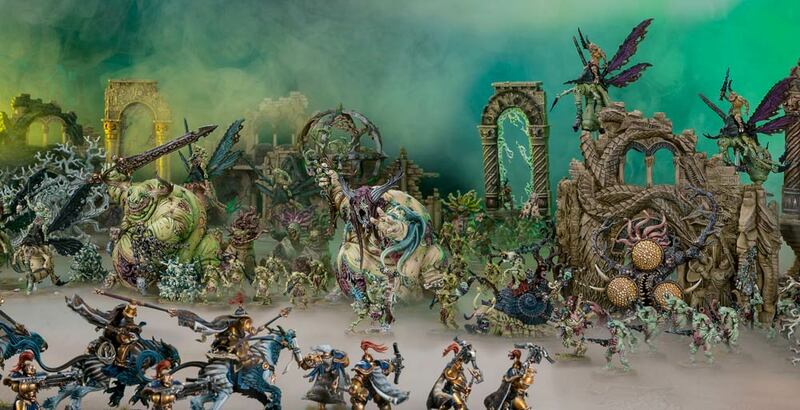 Immediately I imagine the Gloomtide Shipwreck kit of the Idoneth Deepkin repurposed as a Nurgle warshrine, and no doubt many other bits and pieces from the Idoneth range could be combined with Nurgle models to create a very distinctive army. Finally we have the Filthbringers, who are ‘rightly feared for the dark magics and foul poisons they employ in battle’. These guys are thematically linked with Festus the Leechlord, making them the alchemists and mad scientists of Nurgle’s flock. I’d love to see Nurgle combined with a steampunk alchemy theme, perhaps utilising bits from the Kharadron Overlords and various Skaven model ranges. I’m sure you all know this by now, but any model or unit with the ‘Nurgle’ keyword can be added to a Nurgle army and still benefit from the allegiance abilities in this battletome - this includes Slaves to Darkness, some Beasts of Chaos and even Clans Pestilens. I’ve used the word ‘allies’ here, but they’re not allies as such, and don’t take up any of your allies points allowance. Moreso than for any of the other Chaos gods, this creates scope for expanding and customising the theme of your Nurgle army in some interesting ways. As a faction on their own Slaves to Darkness are pretty vanilla, but as a supplement to other more distinctive armies this actually works in the hobbyist’s favour. A relatively generic faction with a wide variety of models and unit types is a blank canvas onto which any number of more exotic themes and ideas can be readily grafted (Flesh-eater Courts are another great example of this). For example, the Maggotkin of Nurgle battletome describes cities that have been besieged by the forces of Nurgle and succumbed to plague and disease. The various Salves to Darkness profiles such as Marauders, Chaos Warriors and Chaos Knights can be used to represent diseased peasants and city guard, perhaps substituting conversions that use Free Peoples and Devoted of Sigmar miniatures for the standard models. Even House Cawdor models from the Necromunda range or (whisper it) Bretonnian miniatures could be drafted in. The book also mentions 'snail-like monstrosities the size of mountains with pox-ridden castles lurching upon their backs' - this sounds to me like an incredible Chaos War Mammoth proxy waiting to happen, or it could even be the basis for a whole table theme. With the release of the Beasts of Chaos battletome (you can read The Hobbyist’s Review for that one here) it’s now possible to add Brayherd, Warherd and Thunderscorn units to your Nurgle army using the ‘Pestilent Throng’ warscroll battalion. Adding some raucous beasts to your Nurgle army could certainly offset some of the more regimented aspects of the army that I described above, and could also help support a theme that leans more towards to exotic flora and fauna of the natural world. You should definitely check out the Beasts of Chaos battletome article for more ideas too. It’s easy to forget that Clans Pestilens have the ‘Nurgle’ keyword, but they do! Strange though it may seem to those of us of a certain Warhammer vintage, you can can now have Screaming Bells and Plague Monks scuttling alongside your Plaguebearers and Great Unclean Ones. The Maggotkin of Nurgle battletome describes 'slinking plague-cults that infiltrate the Cities of Sigmar, gathering in deep sewer chambers to perform unclean rites'. Sewers eh? This sounds to me like an open invitation to get some rats involved in proceedings! Combining plague rats with human cultists based on the Slaves To Darkness unit profiles and wrapping the whole thing in an urban sewer theme is something that I don’t think I’ve seen before - can someone please get on this ASAP? Following the release of Warhammer Age of Sigmar's second edition, every army can now be associated with a particular Mortal Realm. This retroactively grafts a wealth of new theme options onto first edition battletomes, and has the potential to add a lot of flavour. Ghyran is the obvious choice for a 'vanilla' Nurgle army given how closely the lore and themes of Nurgle are tied to the Realm of Life. Death is also part of the great cycle of course, so a Nurgle army themed to Shyish also seems like a natural choice - perhaps focusing more on the emaciated end of the decay spectrum, rather than the corpulence that Nurgle is typically known for. The prospect of combining the diseased aesthetic with fire, metal, light, shadow or beasts is quite exciting too, although how one would go about executing those unorthodox combinations is admittedly something of a head-scratcher. Crucially though it does present a range of interesting creative challenges, and that's most welcome. Being based around a single god with the very distinctive yet narrowly focused aspect of disease, the Maggotkin of Nurgle battletome was never going to offer quite the same variety of theme possibilities found in more sprawling and eclectic armies like Beasts of Chaos or the Free Cities of Sigmar. With that in mind, it's impressive that the book manages to evoke some interesting ideas beyond the standard rotting flesh and rusty axes. The shift in focus to incorporate the cycle of life and the endless diversity of nature opens up new possibilities, and there are some lore fragments that could inspire a very distinctive take on the stereotypical Nurgle force. The Nurgle of the Mortal Realms certainly has more ideas bubbling in his plague cauldron than the Nurgle of the World That Was, which is fantastic and a credit to the Age of Sigmar background writers. For hobbyists wanting to put a truly unique stamp on their miniatures collection with a creative theme and distinctive conversions, Maggotkin of Nurgle could be a good choice - although I feel there are other battletomes that lend themselves more readily to model customisation such as Flesh-eater Courts and Beasts of Chaos. That said, there is still plenty here for fans of the Plague God to get stuck into and enjoy. To get your hands on your own copy of this brilliant battletome, order from Element Games for a substantial discount on the recommended retail price. 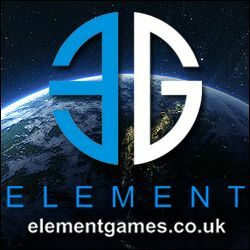 Ordering from Element Games via this link helps keep the light of Azyr shining on the Realm of Plastic.